Citing unnamed sources, Re/code first reported on Wednesday that "The Interview" will be available to rent on Christmas Day on YouTube, Google Play and Sony's website. Later in the day, Sony confirmed that it will be available on Crackle and Xbox Live as well. Renting the film cosst $5.99, while it's available for purchase for $14.99. It became available earlier than expected, starting today at 1 p.m. Eastern, 10 a.m. Pacific. A select number of theaters will also be showing the film on its originally scheduled premiere date, after Sony relented to pressure to release the film. Sony Pictures Entertainment had originally canceled the release after major theater chains refused to show the film because of vague terrorist threats from hackers. Sony reportedly tried to work out an exclusive deal with Apple to release the film on iTunes— talks that were also said to involve the White House. But Apple reportedly felt the timetable for a Christmas Day release was too soon, and declined to make the film available. The film has been the source of a great deal of attention after hackers, said by the FBI to be from North Korea, attacked Sony Pictures Entertainment and released private emails, documents and even films on the Internet. The hackers also made questionable threats of terrorism directed at theaters showing the film in the U.S., but counterterrorism officials have dismissed them as not credible. 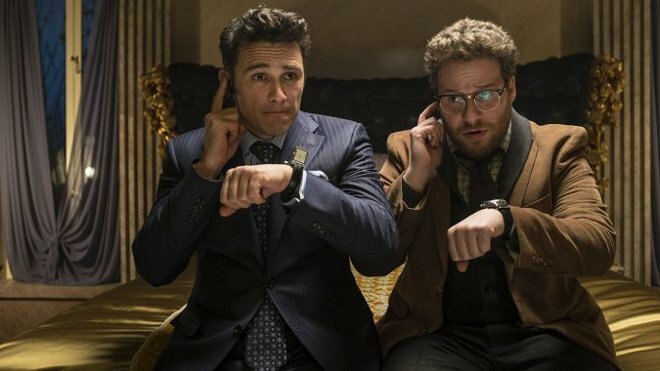 The North Korean government is offended by the premise of the film, which sees actors James Franco and Seth Rogen playing journalists who are instructed to assassinate the country's leader, Kim Jong-Un. Despite all of the controversy, filmgoers will still be able to see "The Interview" in theaters on Christmas Day, thanks in large part to the group Art House Convergence, which will screen it at 250 small theaters across America.